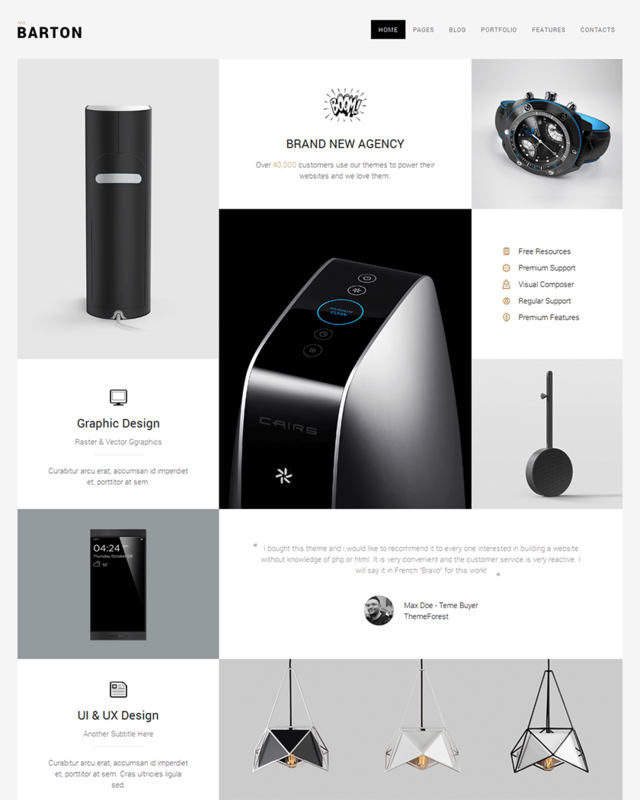 A clean and simple website is one of the most popular trends today. From websites that have lots of features from the late 90s to the early 2000s, the trend has shifted to a simpler and cleaner one. And out of all the WordPress themes out there, it could be a breath of fresh air to land on a simple and clean one without all the unnecessary clutters. Simple and clean WordPress themes do not mean that they are boring. They actually have a lot of benefits for your visitors, adding to their experience while they stay on your site and potentially making them keep coming back. First of all, a clean and simple website makes for an easier read for your followers as they are not distracted by all the clutter some websites have. In addition, navigation is also pretty simple. A clean and simple website helps readers and visitors know where exactly to look if they need to search for something. This is something you can take advantage of especially if you are very particular about placements on your website. Lastly, because of the simple interface of websites as such, readers are able to focus on what you easily highlight. WordPress is one of the most popular blogging platforms right now due to various reasons. 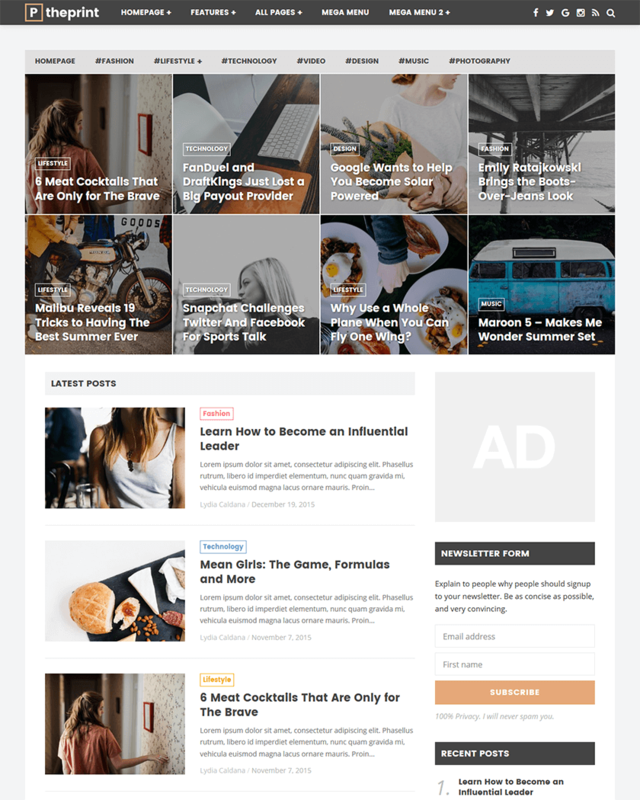 This can be used for free by newbies in the content management platform or can be extensively utilized by pros who need to perhaps create a digital magazine or a blog for money-making purposes. It is very flexible for whatever needs someone who wants to have his or her own website have, making it one of the top choices when it comes to creating one’s own website. Proton prides itself for being flexible. It can be used for showcasing photographs, putting up an online shop, creating a portfolio for artists, and many others. 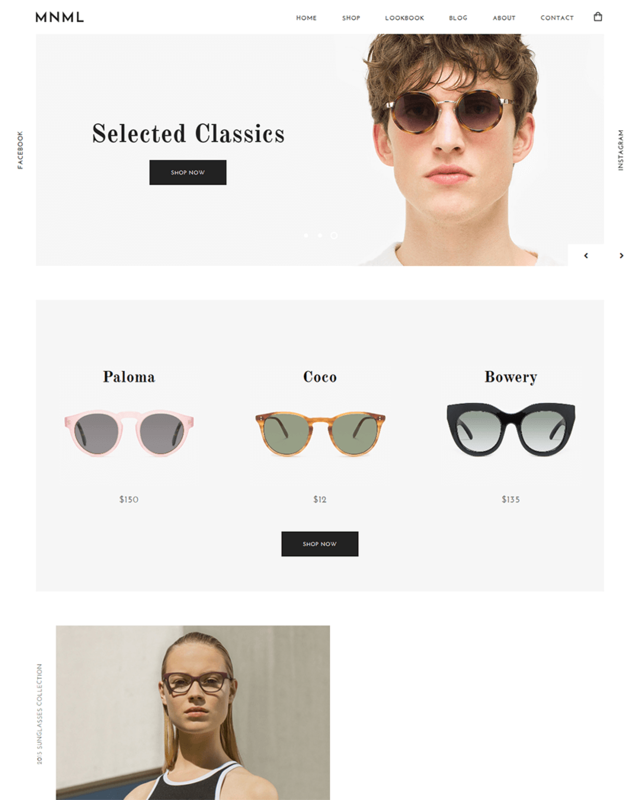 As an online shop, it is already shopping-cart ready with the use of the WooCommerce, AJAX plugin.The reason why it is good for portfolios is its neat grid template that shows your portfolio in clean, same-sized squares. Proton isn’t just flexible for any type of use. Because people are using their mobile devices, whether laptop, smartphone or tablet, to browse online, designers of Proton made sure that this WordPress theme is smartphone, tablet, and of course, laptop, compatible. In addition, Proton is also retina ready, making it highly responsive in any device. Users can also easily customize their Proton theme to make it really theirs by, for example, changing the colors. Proton boasts of three unique headers users can choose from. Rest assured, the theme will still maintain its simple and clean vibe. There’s nothing more classic than the good old newspaper format. For years, this has been what people are used to reading, making it natural for people to read it easily. Designers of The Print capitalized on the newspaper format, making it more modern for the modern internet user. This is perfect for online magazines as there is a clean collage on top of the page for photos and news articles that the user of the online magazine can highlight. These are the very first things the visitors see so users of the websites can control what to focus on. This format can also be good for personal blogs, perhaps for paid posts or even for new ones that the user wants more people to view. Another unique feature of The Print is the newsletter feature found at the side bar. This allows visitors to sign up and stay tuned to the website by sending updates to the visitor’s email. Melody follows a straight up simple and scroll-down format, so visitors can literally just keep scrolling down for entries. It’s as straightforward as it can get -- title and subtitle at the very top and entries below. However, with Melody, only the title of entry as well as the photo, together with the date and section/category of the entry, are seen as a teaser. There is also a menu option available at the top left corner of the site so visitors can easily navigate throughout the website. Details can also be put at the very bottom of the page. Though simple, the code of Melody makes sure that word formatting varies. For instance, block quotes will look different than regular texts. Basically, Melody ensures that text and images are published properly, making the entire site elegantly simple. 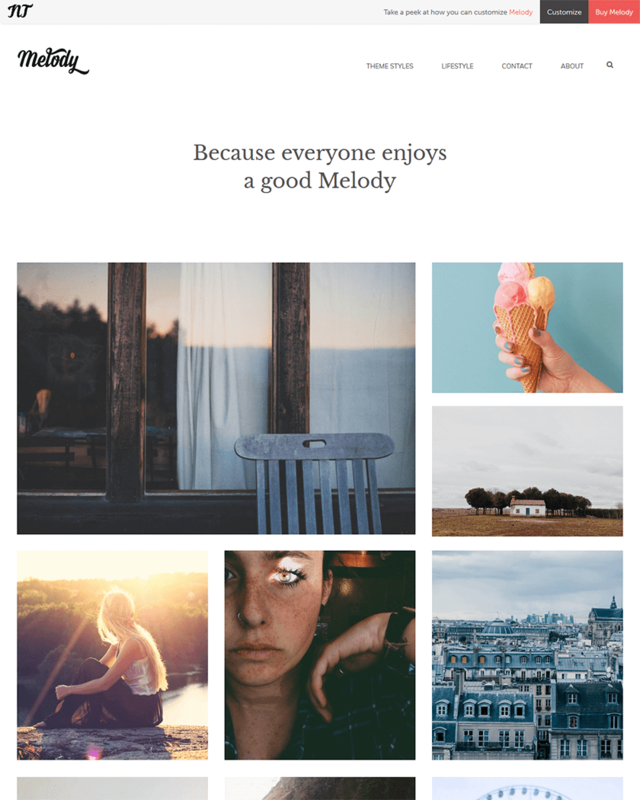 As such, Melody is perfect for personal blogging, creative writing, and most especially, photo essay writing. 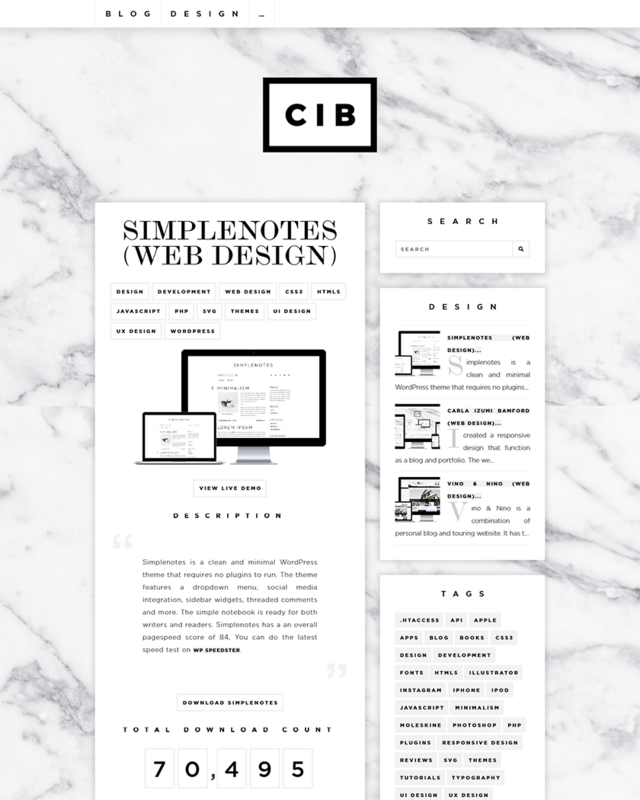 Simple style WordPress theme really lives up to its name. Designed to be really clean, it makes sure there are no features in the theme that most people can definitely do without. Because simple style uses a white backdrop, any hint of color would automatically shine in the theme. The format is also as straightforward as Simple melody -- the title and subtitle are on the very top and all entries can be viewed below by scrolling down. However, for Simple style, there are tabs right below the subtitle where several pages can be inserted. For instance, that is the part where a visitor can click on the page’s About Us, Contact, or any other category available. Designers also made sure that, although simple, this theme can still allow personalization of the theme. Lastly, the theme is also compatible with mobile devices such as smartphone and tablet, ensuring that the website is still crisp wherever it is opened. Some WordPress themes need to have plugins to be installed. This capacity is only limited to paid users of WordPress, leaving users who are using WordPress for free with fewer options. Simple notes, on the other hand, can be used by both paid and free users as it doesn’t require plugins to be installed. Simple notes also allow visitors to just scroll down for more entries, but it also has side bars for categories and archives of past entries. Aside from side bars, users can also put links to different pages for their About Us or Contact Us information. A search button is available as well to further easily navigate around the site. The design also has a drop down menu for more options. Another good feature of Simple notes, which has become a necessity in a highly digital world, is the social media integration, which includes Facebook, Twitter, and Instagram, the top social media platforms as of today. As such, posts can easily be shared in different platforms, reaching more audiences. 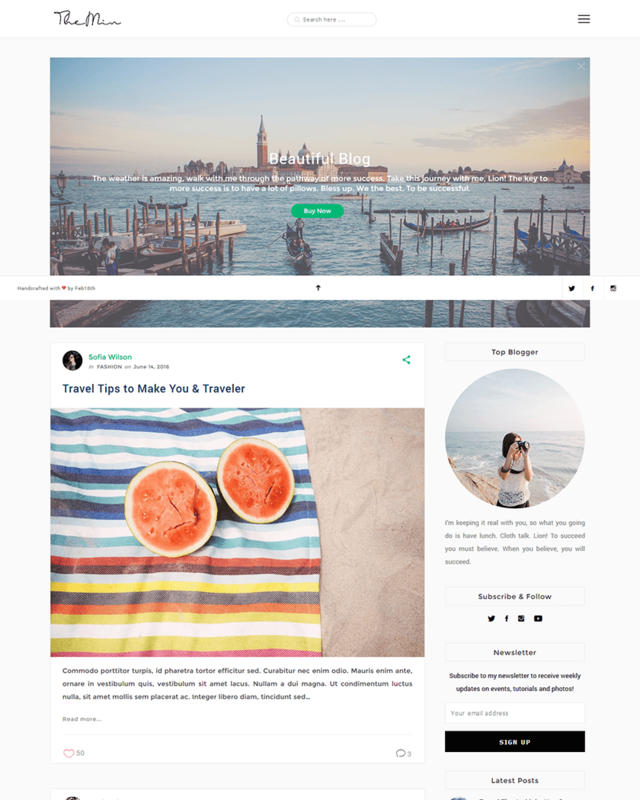 The Basic WordPress Theme is one of the best, simple and clean WordPress themes out there for creatives, whether agencies or freelancers. It makes use of the grid design as well, but not limited to tight squares. The thumbnail would depend on the size of the photo itself. But the gallery can actually be in grid format, masonry, or justified -- however the user likes it. Right below the title and subtitle, sleekly-designed categories can be placed. There is also a drop-down menu available on the top right corner for navigation purposes. Because of its clean and simple design, it is very lightweight both for users and the visitors. It doesn’t take much to load the page. Aside from agencies and creatives, online shops can utilize this as well. It is WooCommerce ready with the AJAX Contact Form so additional third-party plugins or widgets are not necessary. Customization is also allowed for the Basic WordPress Theme. Acrod is definitely another simple and clean WordPress theme that can be multi-functional. It has three different homepages that the user may choose. Acrod specializes in making the website fully customizable. As mentioned, there are three different homepages to choose from, but other than that, there are 24 unique page templates that the user can fully maximize. It also has unlimited sidebars, color schemes, custom widgets, and many others. This can be used for personal blogging, perhaps for portfolio-creation, photo essay writing, or putting up an online shop. On top of this, the theme is fully responsive and retina-ready. This ensures that the user experience is top-notch while the website itself is visually appealing, especially for devices that make use of retina display. This is great for product shots and portfolio creation. Other main features of Acrod include child theme support, cross-browser compatibility, cross-device compatibility, translation ready, and google fonts ready. Lovely is perfect for anyone involved in the fashion industry. Its design is perfect for lookbooks as it allows texts to be strategically placed to describe an outfit or product. Lovely has four different feature areas that the user can choose from. It can be in a form of a photo list, a normal photo with caption at the bottom, a slideshow, or a photo in the middle and thumbnails at the sides. 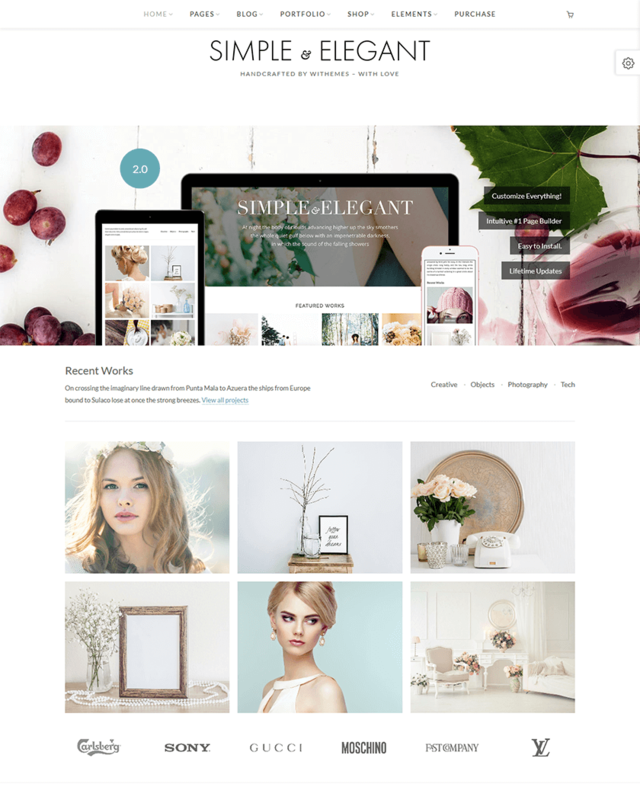 Designers of Lovely probably understand that customization is key in fashion, so it is also applied to this simple and clean WordPress theme. It features 12 different blog layouts, so for sure, users can be unique. The blog itself has three different layouts. The default features a photo and text below with sidebars. The user can also get rid of the sidebar. The user also allows a full-width layout. Other good features include unlimited google font, four theme waves options, excluding and including of categories, and many others. 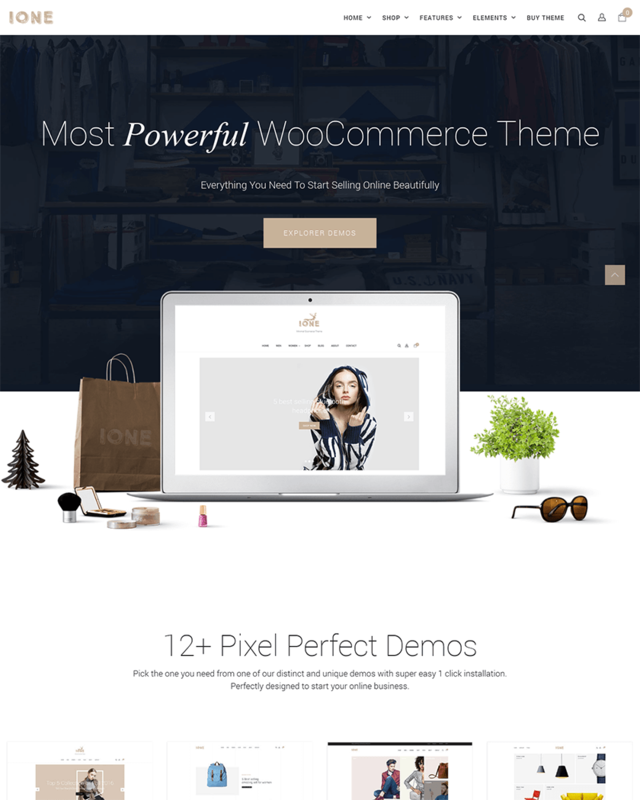 iOne WordPress Theme up the ante when it comes to modern WordPress themes. Just like the Lovely theme, iOne is also good for fashion uses, whether for personal or for brands who want to sell. Unlike other themes, iOne has a vertical mega menu, allowing users to have many categories. To accommodate all these categories, rows and columns are in place. As for the background, users can upload photos with ease. The theme also has a slider that makes the website animated. It is very responsive, which makes for a fascinating user experience. A unique feature would be the advanced layered navigation which allows user to navigate through the page without having to unnecessarily reload the page. Above all, it integrates well with social media platform Instagram which is very important, especially for brands who have a separate social media account to boost reach and influence. This allows for an aligned social media content. 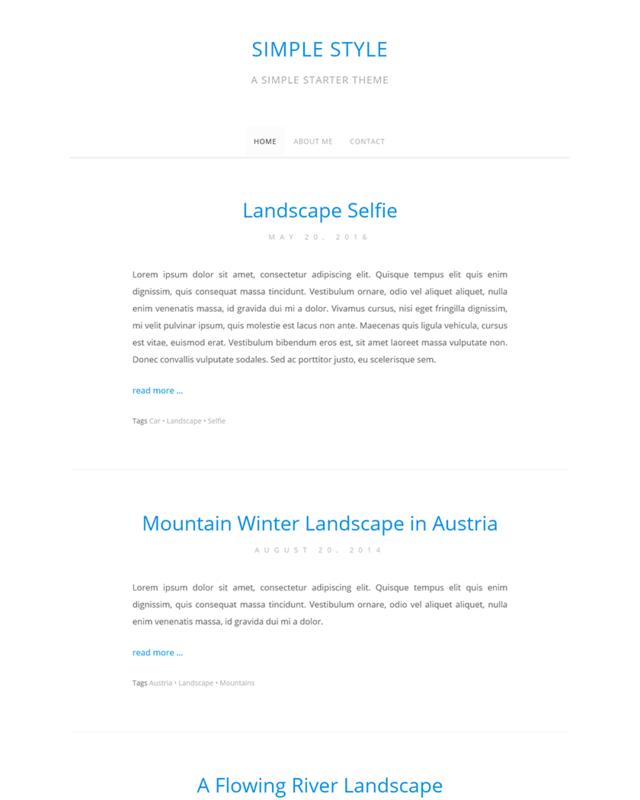 Another simple and clean WordPress theme is SoSimple, as the name suggests. Not only does it look simple with its white foreground laid on top of a green background, the features it offers are fairly simple as well. The theme rejects features that will only add to the clutter of a website, so it limits its features to the ones that the designers believe are necessary and always in use. For instance, it still allows for customization through custom header, menu, and background. The layout, however, is fixed. Sidebars are limited to just the right sidebar, and there can only be one to two columns. However, the header could be flexible, and the layout has a full-width template. It is also translation ready so any language will not be a barrier. Despite its simplicity, SoSimple is proud of being one of the simple and clean themes that are also responsive. The Perle theme is a stunningly simple and clean WordPress theme that gives one’s site a crisp and polished look. This is one of the themes that combines a good balance of text and photo by default. The main features of the Perle theme is that it has a featured content, which allows users to pin a content they want more people to see; infinite scroll, so that people do not have to keep clicking the Next or Older Posts buttons; Site logo, for branding; Portfolio-ready, which makes the site good if the user is a creative that wants a digital portfolio; and Contact Form. Other features that users may enjoy would be its responsive design, which makes it easier for visitors even if they are not using their computers; easy theme options, which makes it easy for users to customize their site; and custom colors, for more personalization of the site. 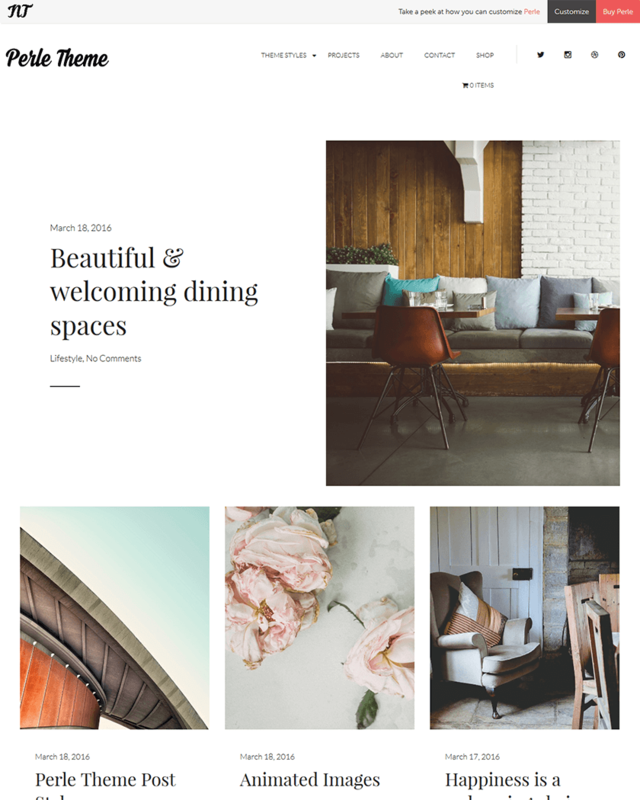 TheMin calls itself a WordPress Theme for lifestyle blogs and websites and fairly so because its layout is definitely perfect for it. Its minimalistic design makes photos pop out from the layout. It has a lot of main features for customization. 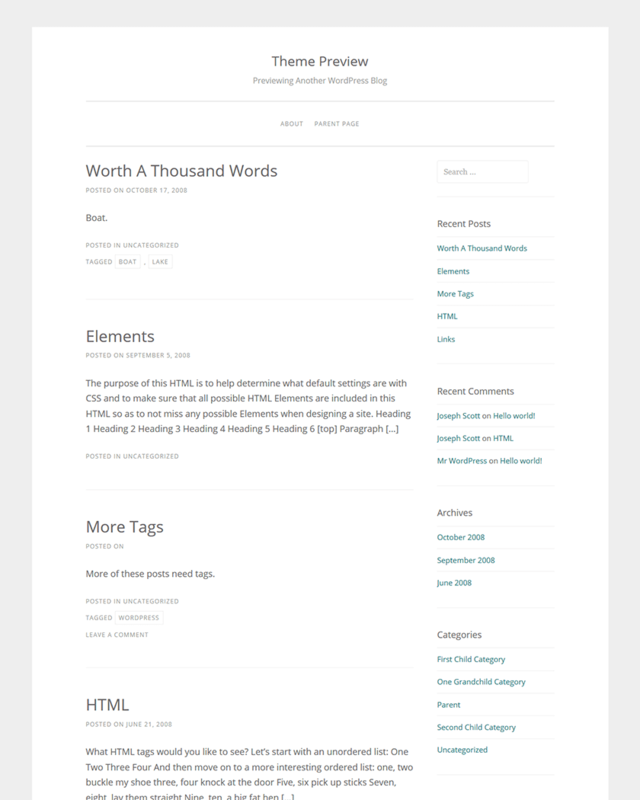 The blog layout can have a sidebar and can be full width. There is also an allotted Author Page. 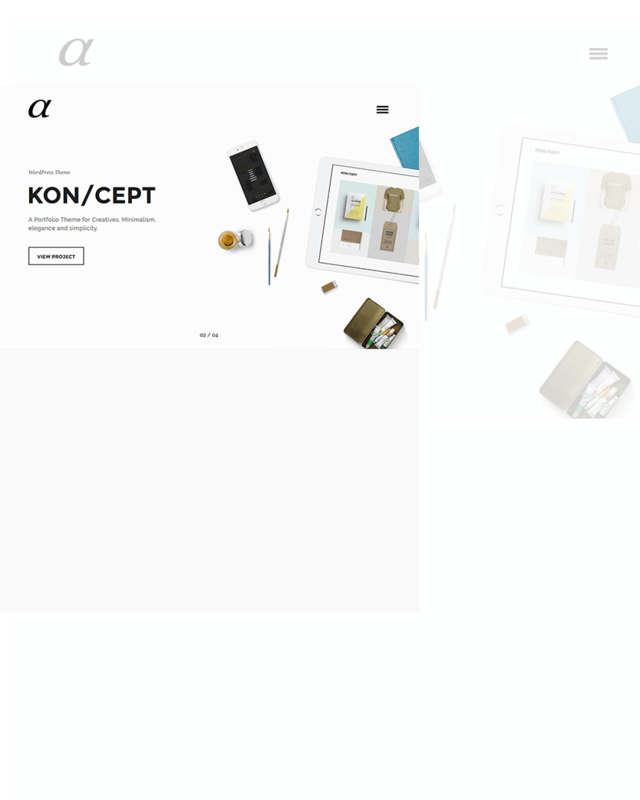 Because of its minimalism, the site can be loaded faster, keeping the interest of readers and visitors. The user can also enjoy its unlimited color options as well as make use of the ads manager settings, which can place ads at the top, at the footer, and also on the post itself. Instagram is fully integrated in the site so alignment of social media content can be assured. In addition, MailChimp is also integrated, making it easier for the user to start his or her own newsletter where people can sign up. Mnml already brands itself as an e-commerce store. The theme is designed perfectly for product shots, specifically for fashion-related products. As an e-commerce store, it is fully compatible with WooCommerce. The design is also easy to navigate so it makes sure that visitors don’t miss a product the user would like them to see. There are three variations to the layout, so users can choose between having a full-width page, a full-width page with banner, and the fixed width. The Mnml WordPress Theme makes sure that customizing the site is an easy experience for the user through the drag and drop layout builder and visual composer. It is also fully responsive so there are no troubles when opening this in a different device. Other main features include typography options with google fonts support, Google maps integrated, CSS Animations, Crossbrowser compatible, Contact Form, Background sections effects, smooth parallax scrolling, and many others. Marshmallow is a cute, simple and clean WordPress theme that looks very quirky and modern at the same time. Its selling point is the amazing Apple TV effect, which does not work if the visitor is using Firefox because Firefox has disabled it. It is apt for creatives, whether designers, photographers, or artists. Users can easily customize their own site with Marshmallow as it has a live preview customizer that allows you how to your site looks visually and without looking through complicated codes. Just like most of the WordPress themes, it is compatible with any mobile device. The user can choose between having a grid blog layout or a list blog layout, depending on what time of content he or she will put on the site. In addition, it also has MixItUp filters. Other features include having more than 800 Google fonts, full width featured image, and SVG button animation, among others. Another clean and simple WordPress theme, Simple & Elegant theme prides itself for being flexible enough to be multi-purpose. Users have total control over customization in terms of colors, and there are more than 300 colors that users can choose from. Users are not only limited to colors. They can also have fun choosing different fonts. In addition, Simple & Elegant is plugin ready, designed to take on third party apps for the benefit of the user: Visual Composer, Slider Revolution, WooCommerce, Contact Form 7, MailChimp for WordPress, and Instagram Widget. This makes for Simple & Elegant’s flexible and multipurpose feature. It’s easy to install, too. Just one click and the theme will be applied to one’s website. If used as an e-commerce shop, Simple & Elegant allows users to create a professional pricing table for visitors and potential buyers to refer to. It also has a mega menu which works if the user has a lot of products to sell. 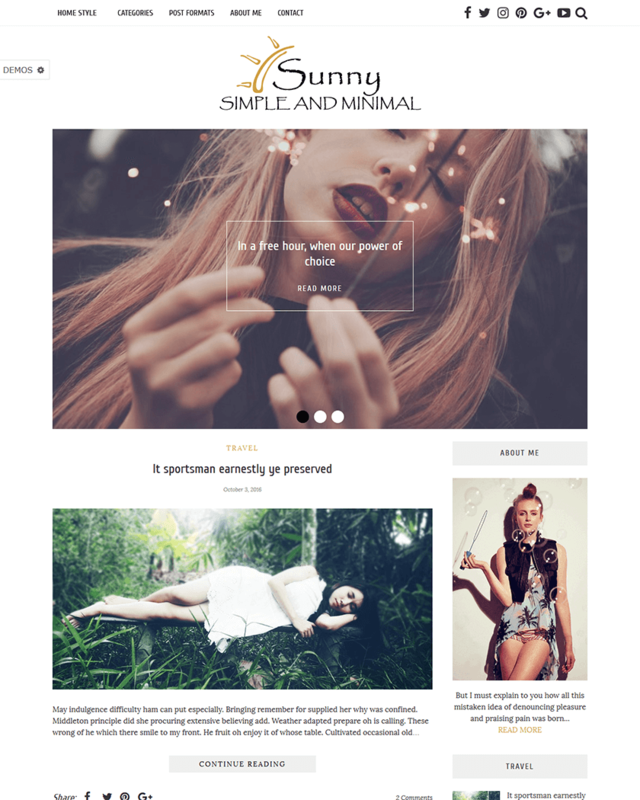 The Sunny WordPress theme calls itself minimalist because of its clean web interface. It is fully responsive, fully customizable, has a themes options manager, is translation-ready, has five custom widgets, five different blog layouts, post formats, and sticky navigation. What’s good about Sunny being fully customizable is that users can choose from an unlimited number of colors to design their website. Other than these features, it is also SEO optimized, load speed optimized, has no theme errors and warnings, offers premium support should there be any glitches, W3 Optimized, has a smart scroll to top for easy viewing and navigating, and free lifetime updates. Simple and clean, Sunny is perfect for personal blogs and photo essay writing. In addition, users can put social media buttons at the top right corner of the website, where the header is, for easy sharing and contacting. Sunny is also compatible to various browsers, including Chrome and Firefox. 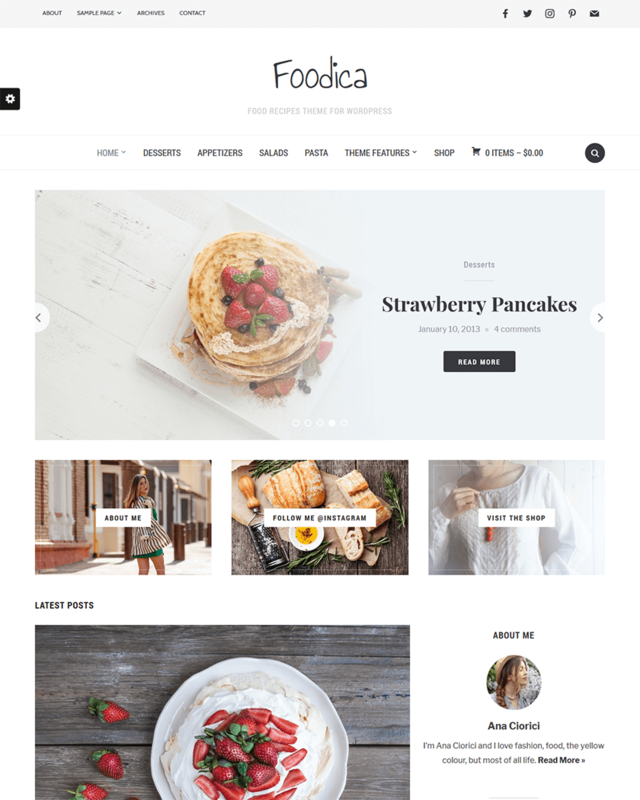 Unique as one of the simple and clean WordPress theme that brands itself as a theme for food blogs, Foodica is definitely designed for recipes and any food-related content. Its unique features include the following: theme options panel, where users can easily change the appearance of the theme; six color schemes users can apply; visual customizer for a more straight-forward and fun customization; responsive and retina ready so visitors can visit the site on the go; multiple ad zones for banners in case users need to promote something; and recipe shortcodes, which is perfect for food blogs. Foodica also just recently improved its mobile menu so more visitors will find it a whole lot easier to navigate the site through their mobile devices. There are also two styles to choose from for posts which is the normal blog layout or the grid type. In addition, slideshows are also allowed for an interactive experience. Another simple and clean WordPress theme made for artists and other creatives is Alpha. Its sleek design can make artworks and the entire portfolio come to life. It actually is developed as a theme for portfolios. Since Alpha’s target market are creatives and artists, the theme strives to make the design artistic as well, starting with its unique slider that could be impressive for visitors. As most of the WordPress themes now, it is also responsive and retina-ready. Although it has a unique slider, it is surprisingly pretty fast in terms of loading and user experience. This is good for artists since there is no limit as to how many portfolios an artist can put up with this theme. It is also translation-ready, like the others, so there is no problem reaching a wider audience. In addition, the user can fix the layout of the theme through Alpha’s drag and drop builder which is pretty easy to use. The Voux is one of those simple and clean WordPress Themes that follow the magazine format. Though it is perfect for fashion online magazines, it can be used for lifestyle magazines in general spanning from travel to food. As a theme that wants to help users be the go-to website for news and updates, it is retina-ready and responsive. It is also fully customizable with the help of a visual composer. In addition, entries posted on this site can be shared to different platforms such as Facebook, Twitter, and Instagram. To keep visitors in the site, the theme ensures that the site is user-friendly, adapting a mega menu for categories and stories that online magazines usually have and having full screen galleries for easy viewing. Though the design is simple and clean, the users have the freedom to put a lot of things on the website. 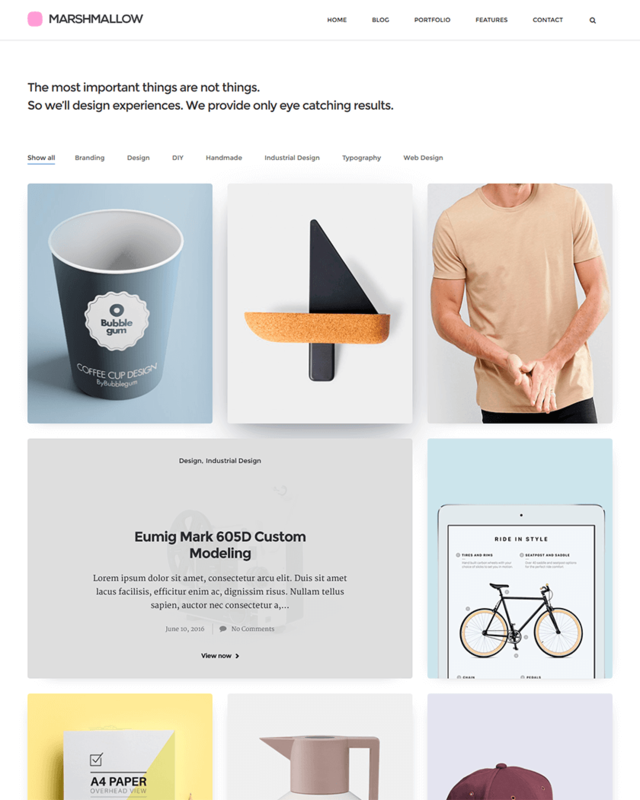 The theme in itself just becomes a clean template for the user’s creativity. 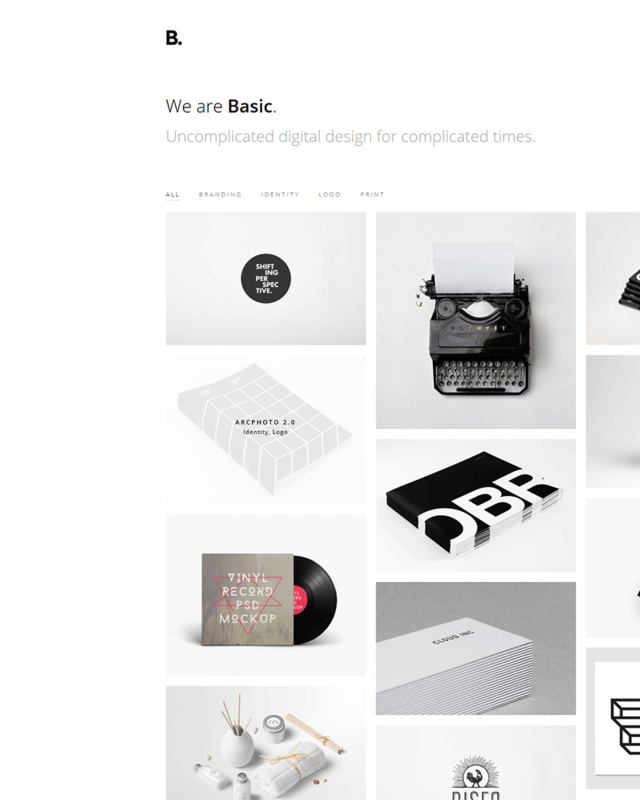 BARTON is a simple and clean portfolio WordPress theme which is designed to focus on typography, usability and user-experience with masonry portfolio grid. 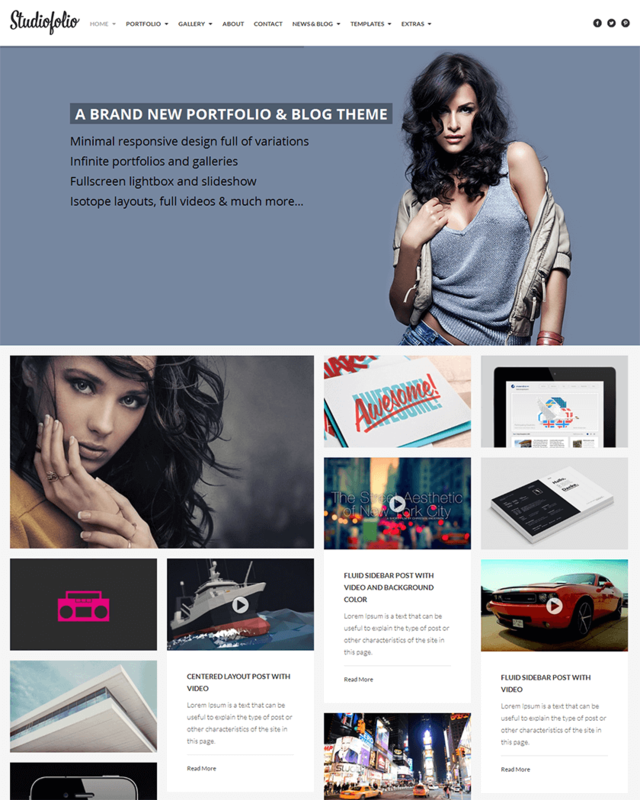 It is bootstrap based Premium Portfolio WordPress templae that is coded in HTML5 & CSS3 and jQuery with simple, modern, also responsive design layout addapts to smaller devices (phones, tablets), retina-ready as well, its also comes with lots of great features to power your personal portfolio showcase or agency portfolio website. BARTON is most customizable, flexible, 24/7 customer support and intuitive documentation. 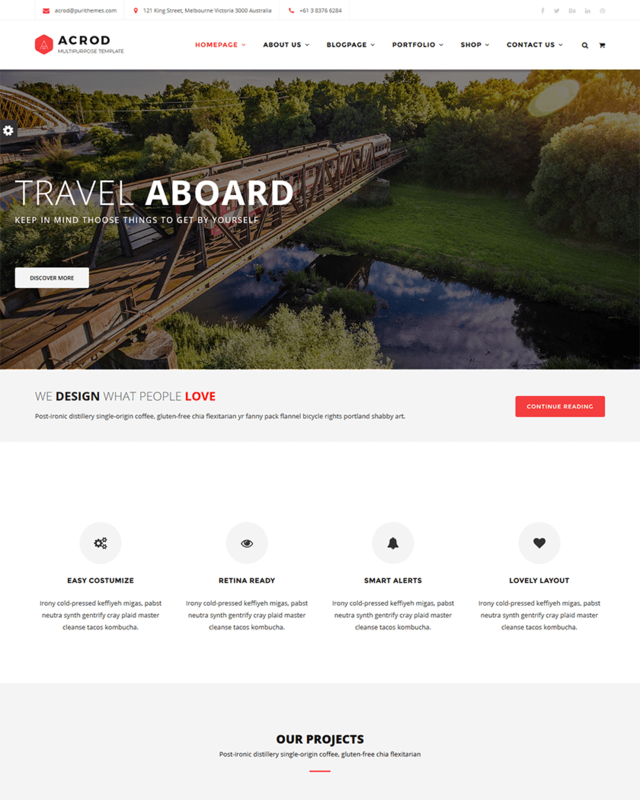 Unfortunately it is the very new simple theme on themeforest with best features and very simple design. Template creator has covered every essential elements quite well to making it SEO optimized and user friendly design with best SEO practice in mind. You’ll definitely enjoy development with this modern template designs! 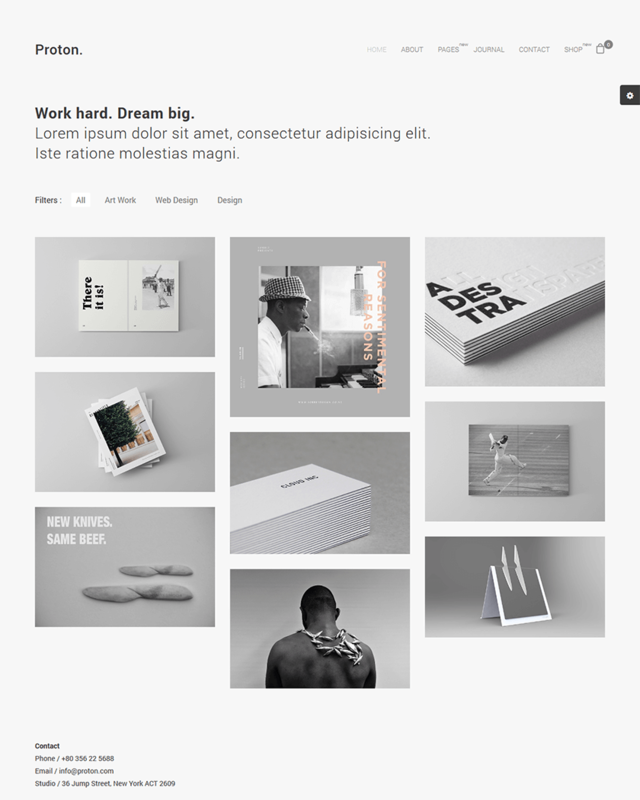 Fluxus is horizontal portfolio layout with clean and minimalist designs. An amazing magazine inspired template for photographers! crafted by intheme (Elite Author), available only for fifty bucks on marketplace! It has focused on typography and big image with catchy title while maintaining the matter of gaining simplicity, flexibility and performance to makes the content and overall look interesting. 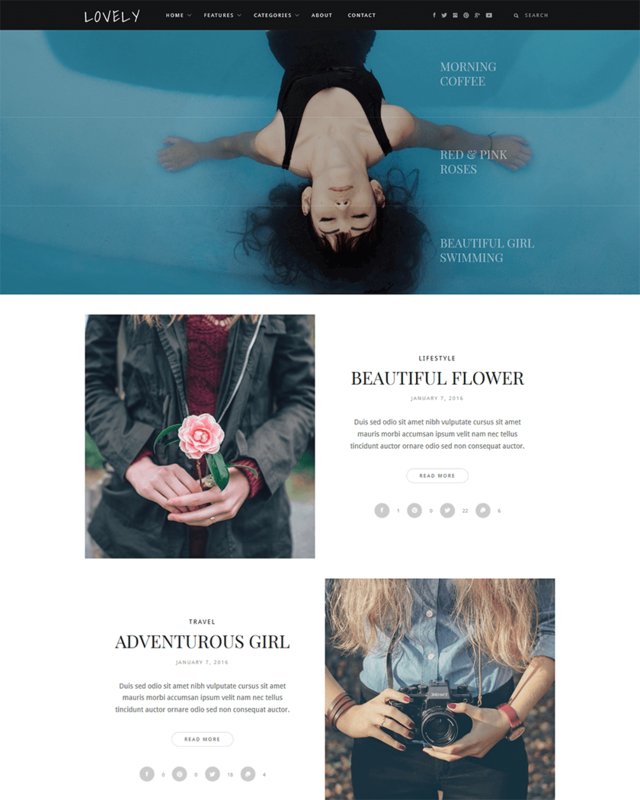 Fluxus is a clean and simple WordPress theme for Photographer that can put a splendid starting impact on your web visitors. It also makes an easy for users to style many elements with shortcodes, including gallery, tabs, typography, buttons and more. In addition, the templaate has light and dark two skins to get you started, where you can give it a few touches to customize or you build custom skins and change styles of all website. Studiofolio is one of the oldest ultra-versatile blog and portfolio theme for freelancers and creative agencies such as photographers, graphic designers, illustrators or any kind of creative. Homepage has a grid and masonary layout making it a fantastic choice for designers. The template is available for at $49, usually when you imagine you will get 64 bucks of premium plugins bundled up inside. Created by undsgn, Studiofolio has an intuitive and easy to use admin options panel for general settings, the navigation, slider and the blog. 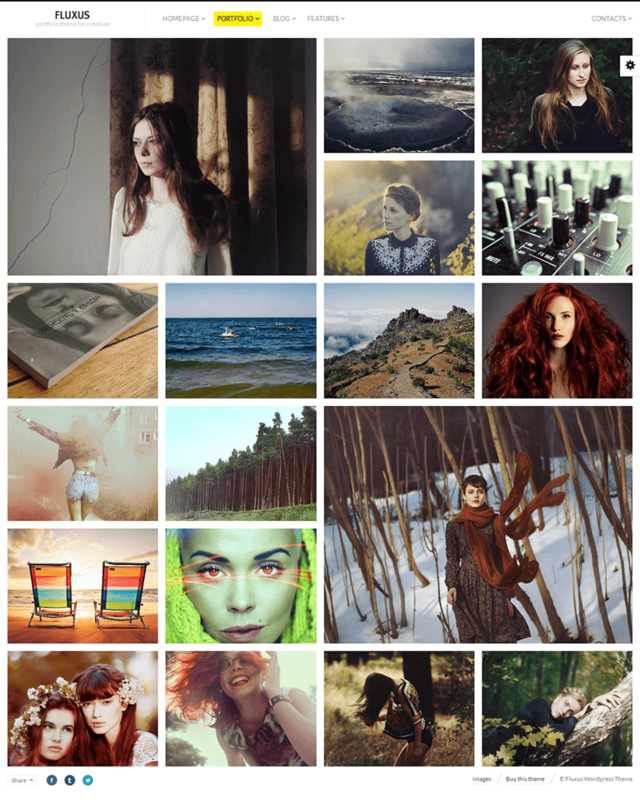 Best of all, the template supports differently blocks size and customizable space between blocks, up to 3 different page style layout, responsive full-screen light-box with panning effect and touch slideshow for video and images, infinite portfolios and galleries, so you’ll showcase your work in beautiful, mobile-friendly, masonry grids. It can be works with all modern browsers.